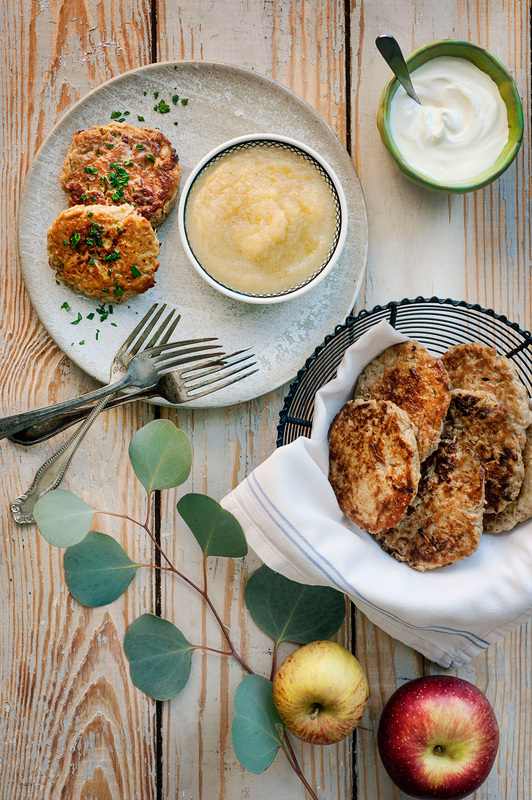 Brunch, lunch, as a snack, or dinner, these potato pancakes are delicious and naturally sweet from apples, cinnamon and teff. Pick them up and eat them with your hands, or scoop 'em up with a fork smothered in apple sauce and sour cream. Add potatoes, apple and onion to the bowl with the eggs. Stir in teff flour, cinnamon and salt and mix until well combined. Shape the potato mixture into patties about ½-inch thick and 3 inch round. Heat a heavy large skillet, preferably cast iron, over medium high heat. Add and melt about ¼- inch coconut oil. In batches, fry the potato pancakes, turning over once or twice, until lightly brown, about 4 minutes each side. Add more oil, as needed. These potato pancakes are naturally sweet. Cinnamon, apples and teff flour make a quick and easy potato pancake. Also known as “latkes” they are delicious any time of day!